As the genus name implies, this is a cryptic animal with dull, brick red coloration and a lumpy appearance,that is often hidden within the seaweed environment it calls home. Diet in the Wild: Nocturnal grazers feeding mainly on red algae, but they will eat young kelp or green algae. The gumboot chiton’s larval stage is vulnerable to numerous predators but adults are most likely prey for some species of sea stars. River otters are reported to eat them, too. Gumboot chiton populations are not considered at risk currently but are long-lived and may not recover quickly if removed from the ecosystem. The gumboot chiton is but one among many other species honoring Georg Wilhelm Steller. An adventurous eighteenth century German naturalist who journeyed across Siberia en route to the Bering Sea, Steller sailed to Alaska with explorer Vitus Bering in 1741. Gumboot chitons were harvested by some coastal Alaska Natives as subsistence food. 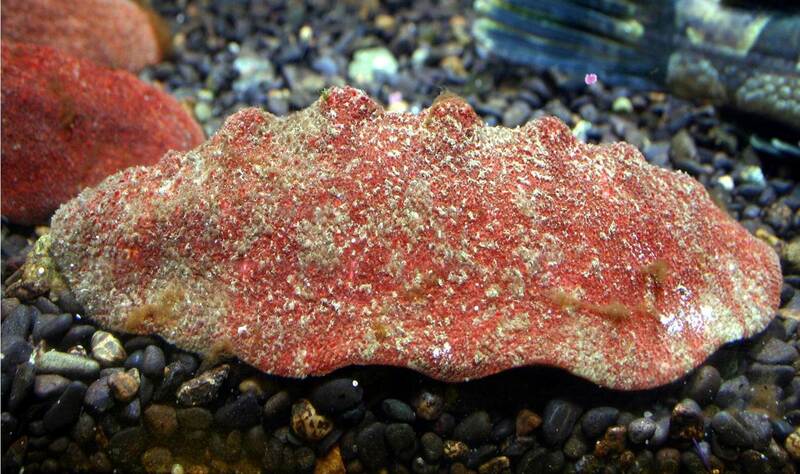 They do not grip their substrate as tightly as other chiton species and are easy to collect by those who do eat them. These are the largest chitons in the world. Most chitons’ eight overlapping shell plates are exposed, at least partially. Gumboot chiton shell plates are totally covered by tough, pebbly skin.